View More In Wall Plates - Page 4. 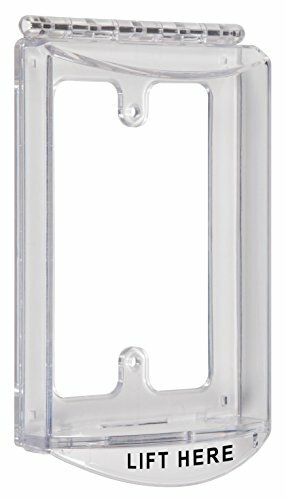 Safety Technology International, Inc. STI-6519 Single-Gang Clear Protective Polycarbonate Cover - Molded of tough, clear, polycarbonate material, this cover helps protect everything from electrical outlets to push buttons to volume and lighting controls. Inexpensive and highly durable, this high strength continuous hinge cover takes hard knocks in stride while protecting digital keypads, data ports, smaller size pull stations, biometrics and push buttons to name just a few. Complete with mounting plate and hardware. Quick and easy to install, the included frame mounts directly through product mounting plate to an electrical box, eliminating the need to drill additional holes in the wall. Cover helps protect against vandalism and accidental damage. The cover is UV-stabilized so minimal ultra violet damage. This has a locking tab for optional breakaway tie. Typical working properties of polycarbonate are -40° to 250°F (-40° to 121°C). Three year guarantee against breakage of polycarbonate in normal use. 94V-2 flammability rating. STI "We protect the things that protect you." If you have any questions about this product by Safety Technology Intl, contact us by completing and submitting the form below. If you are looking for a specif part number, please include it with your message.